How Your Name Affects Your Luck! - The Amazing Power of names! Your name is your destiny. Names shape our lives. The key to success lies in the name. DON'T WORRY: I AM NOT ASKING YOU TO CHANGE YOUR NAME! But few people grasp the absolute importance of names. An actor or singer can remain unknown for years: then he changes his name and fame beckons. The ancient Egyptians believed that to know the name of something was to have power over it. In the ancient world, when an aggressor besieged a city his first priority was to find out the secret name of its guardian god. Every city had its own particular god or goddess of protection who had both a public and private name. If the enemy obtained the secret name the city was considered doomed. Ancient battles were fought both militarily and spiritually! From time immemorial secret magickal orders have sworn their members to their own secret names! THE ANCIENT EGYPTIAN MAGICIAN-PRIESTS WERE FIXATED WITH THE POWER OF NAMES. Because names, when sounded or written, resonated to the numerological rhythms of the unseen universe which controls the forces of destiny and fate! WHAT I PROPOSE IN MY BOOKLET IS THAT YOU FIND YOUR OWN MAGICKAL NAME AND MERGE IT WITH THE THING, CIRCUMSTANCE OR PERSON YOU SEEK! The secret cult of the magickal name works its power mysteriously and automatically. It gets results! My booklet gives you information which has rarely been available, INFORMATION BASED ON OBSEVABLE FACTS AND NOT WISHY-WASHY FANTASY! Anyone can apply this highly potent information. No difficult rituals involved! No candles, and so on. 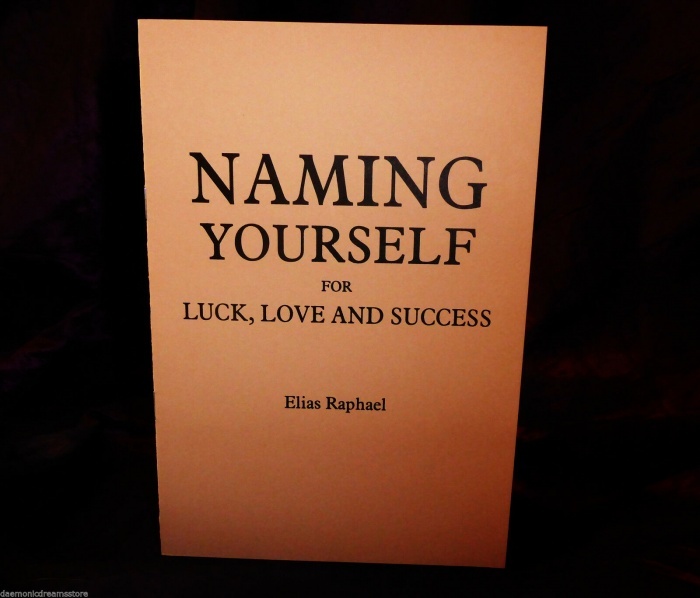 You can modify your existing name, or not change it at all, but creating instead a secret name for yourself - which will magickally connect with the object of your desires! HERE IS PRIMAL MAGICK WHICH CAN HAVE THE MOST STUNNING EFFECTS! Safely and surely! A man needed a large sum of money quickly (£150,000- about $300.000 in U.S money). I showed him how to make a name which could connect with his need. He found it easy. The magick began working. IN THREE WEEKS HE RECEIVED $224,000 - CONSIDERABLY MORE THAN HE NEEDED! A widow-pensioner dreamt of a six-week luxury sea cruise she couldn't possibly afford. She created a magickal name, and I then showed her how to merge it with the 'name' of the cruise she desired. Shortly after, she received the exact amount of money she needed to make her dream come true! Moreover she modified her official name - just by inserting two additional letters - and she reported that she just gets luckier and luckier! I explained to a betting man the magickal power in names; he now wins consistently! In the ancient world, magicians and priests were under pain of death not to reveal secret magickal names, such was the importance attached to them. THIS POWER IS NOW AVAILABLE TO YOU TO USE AS YOU PLEASE. MERELY ALTERING YOUR PUBLIC NAME SLIGHTLY CAN MAKE ALL THE DIFFERENCE TO YOUR LUCK. It is so easy! Use this power now and prepare to see an improvement in your luck! As best I know, my publication is the only one to print containing this vital magickal information.